Choosing a Shade-O-Matic Regency Roller Shade means you have selected a timeless window fashion. Classic roller shades offer an affordable style with an extensive selection of both classic and contemporary textures and colours. Add a Fabric wrapped headrail to your roller shade. Maintenance is very simple; a damp cloth is all that is needed to wipe down vinyl shades. Jacquard fabrics can be lightly vacuumed with an attachment. Drop by today to speak with a professional Design Consult about Roller Shades at Sheila’s Window Toppers & More. . .250 Crowfoot Cres. N.W. Use a damp cloth to wipe down vinyl shades. Other fabrics can be lightly vacuumed with an attachment. Learn more about Regency Roller Shades. Shade-O-Matic Regency Roller Shades has a large collection of both classic and contemporary fabrics. Large assortment of light filtering sunscreens. Large selection of flame resistant fabrics for commercial application. All screen fabrics are ultra-sonic cut, help prevent fraying of edges. Matching fabrics are available in our Roman Shades and Panel Track collections to further expand your design possibilities. 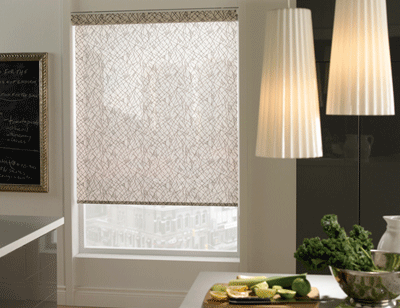 Environmentally Friendly – Regency Roller Shades carefully consider the environment for healthier living.